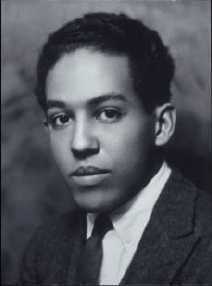 Born James Mercer Langston Hughes in Joplin, Missouri, he was a gay poet, writer and editor. Together with Countee Cullen, he was an important figure in the Harlem literary Renaissance of the 1920s. A prolific writer, he used almost every conceivable form to arrange his thoughts on paper: poems, songs, novels, plays, biographies, histories and essays. Hughes wrote in many genres, but he is best known for his poetry, in which he used musical rhythms and the oral and improvisatory traditions of black culture. In 1925, while working as a busboy in Washington DC, he left three of his poems by the plate of American poet Vachel Lindsay, who recognised Hughes's abilities and subsequently helped to publicise his work. Beginning in the 1930s, Hughes was active in social and political causes and used much of his poetry as a vehicle for social protest. He wrote more than 50 books.